Rated 5 out of 5 by lcapova from I did enjoy it! Great visuals! The game is truly amazing! The visual style is different from what I have seen, its very detailed, I wander if there will be some "HD" version, mayb on Ipad? The game is set into fantasy settings, its basically fairy tale but for not exactly for kids, I'm not saying its gory or something like that, but its realistic, also the spells seems to work in logical way #you need components to craft magical items, you need to know recepies, etc.#. The sound and music plays big role in the mood and atmospehere. The cutscenes are great, I don't know If I have ever seen such realistic characters, they look almost like real actors. Its really great game. Rated 5 out of 5 by pennmom36 from Inside Morgiana's World What a great game, don't let this slip past the radar! I have to admit, I wasn't expecting much when I downloaded this game, I was certainly wrong, and I knew I was going to like this game as soon as I watched the introductory video. A strange force waits outside of the castle until Arabelle falls asleep and whisks her off into the night telling her to remember nothing. When she wakes up, she has no idea who she is or where she is. One thing is clear, the castle she's in isn't abandoned, but who lives here? This isn't an easy game to play, there were times when I just didn't know what to do next, and the hint button simply tells you that there's nothing to do here. You find a little talking mouse (that just so happened to eat the wrong book!) and he will help you out along the way. They have done a nice job with the graphics and an excellent job with the videos, even the characters are very well drawn. There aren't a whole lot of Hidden Object Scenes, they are slightly interactive list finds, this is more of an adventure game than a HOG. The puzzles aren't bad either such as turning several rings until all of the snakes are complete from head to toe. I think for a standard edition game only, this is an excellent game, enjoy! Rated 4 out of 5 by tutortime from Interesting Game. Whats great about this game are the Sci-fi scenes. There are many different scenes to interact in and the map is very helpful to move quickly in the game. The most interesting and intriguing scenes I have seen on a BF game. Rated 4 out of 5 by ToK123 from What a GREAT game!!! Very good game! I like the environment of the abandoned castle, the atmosphere is great. The videos and voice overs are very professional. The puzzles are logical and fit into the enviroment and the story. There is a map which I didnt use much (yet) and also the Taks list which came in handy. Everything is really smooth and the mystery of the abandoned castle really got me. I recommend the game! 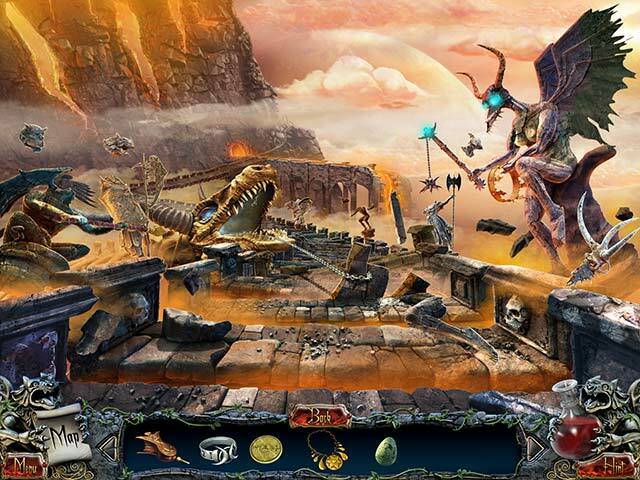 Rated 4 out of 5 by mamameemee from Fun hidden object game This is a fun game. The story line is a little different and I enjoyed the cut scenes. All fit into the whole game and makes it an adventure. I would buy this game. Rated 4 out of 5 by biscuitsmama from Surprise, Surprise - A Great Little Game! Well, I love this little gem of a game and think it was quite a find when I saw it this morning. After my first “rescue” I was hooked. I now have a quite literate, talking mouse that wears glasses and is quite cute. The game is a story we have seen before so it is nothing new but I do like the package. The game begins as we wake up in an abandoned castle and begin searching for clues to who we are and how we came to be here. As I said, the story is nothing new but it is done very well in Mysteries and Nightmares Morgiana. The game is fairly straightforward with not many options to customize the game. Most notably missing is the option for widescreen so we are left playing the game with black bars on each side. It is very seldom today that games do not automatically come in widescreen, so it is a bit of a disappointment to find a game that cannot easily be adjusted to a larger size. That being said, the graphics are quite good. I like the scenery and the “old” feel to the game even though it is obviously a newer development since it has video cutscenes that are excellent and often give a different perspective of an area. There are excellent voiceovers in the game and I particularly love the voice of my “friend” Jack whose voice sort of melts my heart. Overall, the entire sound package in the game is excellent and that includes the music and ambient effects. In the end, I would have given the game a higher rating if it had widescreen presentation. There is a picture of your character on the top left of the screen and when you click on it you have access to your notebook. The notebook keeps track of the story and your objectives and also has a tab for the map, although the map is independently located on the lower left of your screen. The map is interactive and that lets you move quickly from place to place. One of the things I like about the map is that even if you can’t see all of the locations, you can click on the map and move it around so that you can see other locations that are available. It seems like there are more puzzles scattered around than there are HOS. I’ve only found one HOS in the demo and that was tricky to find. When I finally located the HOS, I had a difficult time locating the items because with the small screen, items were very tiny and hard to find, so I hope that the game is more adventure than HO. I found myself relying on the hint button more than usual, and the hard part is that the hint button is very slow to refill. Overall, if you can get past the small screen, the game is very good and worth a try. I will use a PCC, which is one of the nice benefits of being a BFG member. As always, I recommend that you at least try the demo to see if this is a game you will like. Rated 3 out of 5 by Torpedo1 from Grew On Me This game play was a little rugged but the cut scenes were a bit different. At first I did not like the game. The cut scenes seem to cut in too often. But as the game settled in things got better. It still seem an odd game but like it anyway. I had to use the map a lot on this one to indicate where work needed to be done. Nice jump map very helpful. 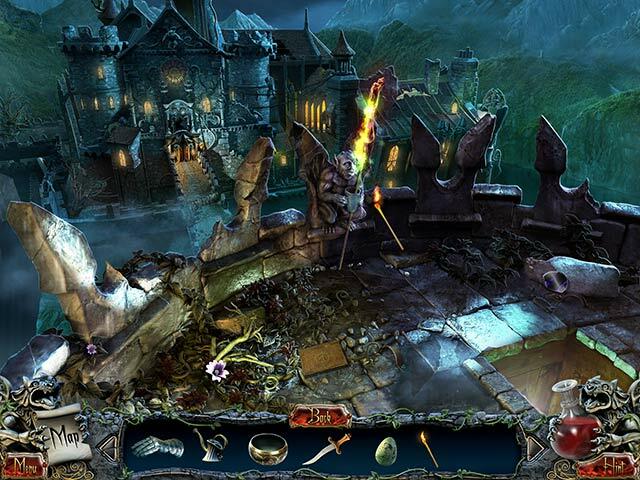 Rated 3 out of 5 by mrm2006 from Morgiana - No Mystery - No Nightmare The graphics were just ok. The music, again, just ok. The storyline did not flow well. It just didn't have the continuity I like to find in a game. HOGs and mini games were, let's all say it together ..... ok. The game bored me and by the time the hour free demo was up I couldn't have been more grateful. However, in the spirit of being a good sport, I will encourage everyone to give this game a try. Again, it's a rather l-o-n-g hour and it's free. Happy Gaming! Rated 3 out of 5 by dancemom1 from Nice try, but no thanks... Hi all. Well, again, I guess I'll be different today. Haven't seen, or don't remember, this deve before. Graphics weren't too bad, but not all that good either. A bit blurry and everything was so small, that my eyes got tired very quickly. Game play was just okay, a little slow and some choppy movements. Did not care for how the instructions were set up, very difficult to read on the game background and too messy. There are a lot of cut scenes and a lot of running back and forth. The sound FX were very well done. There is a map, but it does not show areas that have anything to do, even in easy mode, which is how I run all demo games. If it doesn't run smoothly in easy mode, it certainly won't do well in hard. HOPs were nothing new and items were very difficult to see...too small. Even the words in the inventory were small. Puzzles were very simples, nothing new here either. Hint system was not helpful at all and took quite some time to fill. When I need a hint, I don't want to see "you cannot do anything here right now." Really? That's why I asked for help! There was no real flow to the game, so it was hard to figure out where to go next. I like challenge to my games, but this one left me scratching my head. The only challenge was running back and forth to all the different areas, trying to figure out where you are really suppose to be. This one made me end up frustrated and with an eye strain headache. This could have been a fairly nice game, but fell a bit short, due to small everything and a not so helpful hint system. I'm not even sure a beginner would find this one fun, just frustrating. However, I have been wrong before. Nope, this one isn't for me today. I very seldom do not recommend a game, even if it is only for beginners, but can't do this one. As always, try it for yourself and see what you think. We all have different tastes in games and you may find this one to be exactly what you are looking for today. Thanks for the reviews. Rated 3 out of 5 by scamp69 from day early, played full 60 min. For excellent review see "AverageSizeFish". I BETA'd this 4/14/14. And am pleased with improvements. Tips: do select the Tutorial; watch Gargoyle's eyes to see if something can be done in that place; MAP has indicators also and is a jump-map. Unfortunately the visuals are grainy and it is SLOW. I would not pay money for this game but may use a PUNCH if nothing better shows up. DO NOT BUY UNLESS YOU TRY!!! Rated 3 out of 5 by lucygirl7 from UNIQUE When I started playing this game I thought it was really neat. It's so sloooowwwww. It just takes so much time to get from one place to another, but I loved the heroine and and little mouse. I had high hopes. I even like the graphics even though they aren't that sharp. For some reason they just work. I'm kind of out on this one, but I will recommend it. Rated 3 out of 5 by Clozar from Painfully Slow This could have been a good game. I found it painfully slow. Graphics were not great. HO's and puzzles were okay. I use headphones when playing and adjust the music, voice and effects volume as needed. I found with this game even when I turned them right down when a video came on the sound effects blasted me out of my chair I had to take off my headphones and the volume was so loud I could hear it quite fine with them off. This is the only game I have played with this problem. Needless to say I then muted the game. Too Bad. I did play the full demo. But because of how slow the game is it will not be a purchase for me. Try it yourself, each to their own. Rated 3 out of 5 by Dan2678 from Nothing special I loved the graphics,the sound effects and visual aspects of this game but having played through it I have to say it didnt really do a lot for me.It didnt feel like anything special and the storyline (such as it was) felt rather weak.All in all I wouldnt recommend this game to others,there are far better ones out there. Rated 3 out of 5 by JustTheFacts from Pretty Good, But A Bit Slow BASED ON DEMO IN BRIEF I liked having a quite different style of graphics in this game. It is a shame it is not available in widescreen, in this day and age, but the videos aren’t bad, and the artwork quality is decent. The intro is different, I loved the way we moved around for a 3D inspection of the environment. In reflections and dark spots, the evil sister? , if that’s what she is, can be seen, in a variety of translucent flashes. It is done very nicely. Sounds are good, including the voiceover. The special effects sound for picking things up was a bit trying though, and you have the option to mute the game. You go to sleep. When you wake you have no idea where or who you are. And the intelligent talking mouse you rescue is no help. Not at answering these questions at least. You are in some kind of weird abandoned castle, although there are many signs that there is someone around. 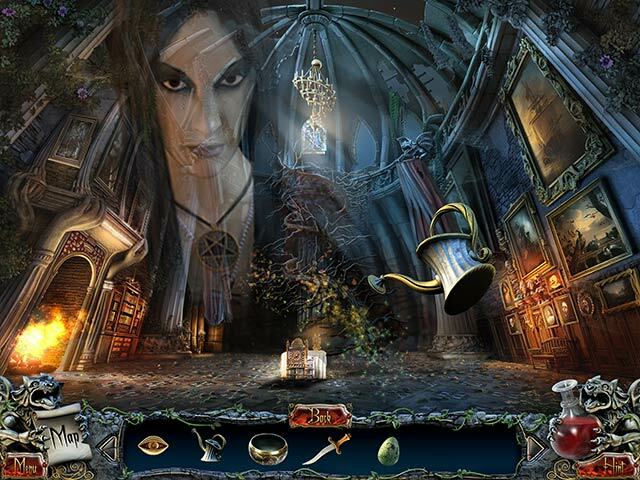 The magic room you find allows you to create magic tools for use in overcoming obstacles, and so you make your way through the castle, trying to solve the mystery of your life and family. This is a fairly standard interactive HOP and adventure game. The HOP scenes are clear and require some form of interaction. The puzzles are interesting twists on familiar ones, and not too, too difficult. The hint does NOT give you directional assistance, but the interactive jump map tells you where there is something to do right now, if a scene has been cleared, and where you are. As well, a gargoyle that is part of the inventory panel, has eyes that glow when you are in an area that has actions to do. You also have a list of tasks to perform, and with it are the notes you take of what is going on. The various magic items you create seem to stay with you at least for a while, and give you useful powers – such as a levitation spell. That mouse also stays. It’s a good standard edition game. I won’t hesitate to use a punchcard coupon code on it. But it is not a masterpiece of the genre, and it would be a bit harsh to judge it against some of the excellent CE games we have had recently. It is simple, mildly different, and not too trying. It’s major weakness is that the action is a little slow. Rated 3 out of 5 by belamba from Quite liked it but.... Thought this game for a non CE was really quite good. It's not a buy though as no game modes, and it's totally spoilt by having sparkles all over the place. I played the whole trial hour, and the two HOPs I came across were nicely done and quite challenging. The puzzles were ok too, with some new takes on old themes. The jungle noises got a bit irritating, and the game seemed a bit disjointed. The hint wasn't much use as just 'There's nothing to do here'. There was a map, but couldn't see the point in it as it didn't tell me anything. I'm sure it will appeal to many, and a great game for newcomers to the HOG genre. Rated 2 out of 5 by jmccarra from A WASTE OF TIME Between the small, hard to see objects and the slow, drawn out videos, it was hard to finish this game. The voice of the main character sounded like a child faking a horrible accent which I found so annoying I had to turn off the volume. I usually don't like using a map to get around in games, but often it made no sense at all as to where to go and the hints were useless so I used the map just to get to the end as fast as possible. Since I paid for it I wanted to finish it, but I would have been happier just quitting the game. Rated 2 out of 5 by AENEASCREEK from Disjointed Drearily Dark and Disappointed I really want to give this game more than 2 stars. I just can't. I have to agree with all of you who complain that the graphics are too small in the HO scenes, the whole game seems to run that way. The artwork is really beautifully done, but that is overshadowed a bit by the smallness.... and Yes, it does run slow, the map is annoying and I too dislike seeing "There's nothing to do here" with nothing further to guide you. All that aside, the one big thing that makes it a big No buy for me is the darkness of the game; oh and it's predictable. It just has too much of a sinister evil flavor , the wild laughter and dreariness got old quickly. When you add the other issues to that, I couldn't finish the demo it just wasn't fun for me. This is a definite try before you buy. Rated 2 out of 5 by ReneThePig from Trial Review - No buy for me Ugh. The game didn't play in full screen. In this day and age, I'm not purchasing a game that requires me to change my screen resolution. The bit of the game I played was rife with slower than molasses cut scenes where the girl is wandering...slowly...looking around at everything...slowly. I was too bored to keep at it. The mouse was adorable - but one cute, funny mouse is not enough to get me to open my wallet. Rated 2 out of 5 by munvig from dark and plottery Hated this game! It was way to dark and all the details so very small. And all thoose short videos, no no no. A pity. Rated 2 out of 5 by hibc60 from I don't get the great reviews I tried playing this game three times but each time it just frustrated me. the hit button just says you can't do any thing hear most of the time but doesn't tell you where to go. the map shows the places to go but not where you have something to do. each time I tried this game I just got frustrated. sorry wanted to like it but just can't get there. Rated 2 out of 5 by cherleadford from Terribly Boring ansd Slow Very bad graphics, real slow and boring. Only finished 30 minutes of the demo and just could not stand to play more. Rarely do I rate a game 2 stars, but I felt this deserved it. Maybe all of the games gets better but I have no desire to buy it. Rated 2 out of 5 by DiDi212 from Not Today. Based on partial play of the demo. This doesn't offer a game mode. All HOGs offer at least 2 choices. There are too many cut scenes and this game ran slowly on my 2013 laptop. Getting the sound regulated was tough -- what seemed okay for the game wasn't the same for the cut scenes. This game didn't draw me in to the story. I believe it must be very old and not a new game at all. Please play the demo and read some reviews. There just isn't anything nice I can say about this game. Rated 2 out of 5 by roberta3 from Not my favorite This game was beautiful and interesting, but slow. Also, I too am tired of the animal helpers. Sorry, I tried twice to like this game, but no go for me. Rated 2 out of 5 by shihtzumum from Terribly Boring OK, she is lost in this old Castle with all kinds of pitfalls and needs to find out who she is and how to get away. Could have been an interesting story if it moved along faster. Video scenes were soooo slow and long and all you wanted was for it to end. Screens were small because they used too much fancy framing around it, I guess trying to make everything fancy...bad decision. When you found an area of interest, it was slow to zoom down to the interest area. Puzzles made little sense and had little direction. Sorry, I didn't finish the Demo, had 15 minutes left, but I was gone and game uninstalled. This game seems to be a bad attempt at Old School games of the past. Even back then, this one wouldn't have made the C List. Rated 2 out of 5 by AverageSizeFish from No mystery just a nightmare The graphics are grainy, grey, and uninteresting. The visual appearance is reminiscent of games years older than this one. I wouldn't have minded this if the rest of the game's features were compelling in some way but they weren't. The storyline is one of those "heroine kidnapped by evil jealous sister struggling to find her magic power and get home" ones. Following a rather poorly done cut-scene our character wakens in an apparently abandoned castle where she is befriended by a talking mouse that she carries in her inventory for the rest of the game. She then wanders around performing seemingly random tasks that get her inventory items she uses to perform other seemingly random tasks. If she wasn't constantly talking to herself about what she was doing I would have had no idea what I was supposed to do next. During her wanderings you're treated to dramatic cut scenes of her doing things like walking slowly across the room. It wasn't clear why such mundane activities warranted a cut-scene and the frequent interruption of game play made it impossible to become immersed in the story. The HOS are confusing in that the list has items of different colors but the colors don't seem to mean anything. They aren't well integrated into the game and while you perform them you are interrupted by things like diary entries popping up as you're trying to find things. They are also very easy. The puzzles are worse than typical in that things like match three games are included where a puzzle normally is. It's unclear what a match three game has to do with the theme and equally unclear why the developer chose to foist one on me when I was looking for a HOPA game and not a match three game. It's great when people who don't like HOS can choose match three instead but not so great when people looking for a HOPA are forced to play a style of game they weren't looking for. Overall, this game features a boring plot which unfolds very slowly in a pretty dreary looking setting. Game play involves repetitious back and forth clicking to perform largely random feeling tasks. The fun factor was so poor I could barely make it to the end of the demo.